Each week residents in Sefton fill their bins and wave good bye to their waste, but what happens to the waste once it’s been collected? This guide will provide insight on what kind of waste can be recycled, what happens to the waste after our bin lorries have collected it and what happens to the waste that can’t be recycled. In Sefton, brown bins and hessian sacks are used for recyclable waste. It’s important to understand exactly what materials can be recycled and how this should be presented. Visit https://www.recycleright.org.uk to find out exactly what can and can’t be recycled. 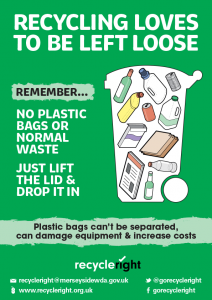 Remember to never put your recycling in bin liners, plastic bags or refuse sacks of any kind. These types of bags and normal waste can’t be separated from your recycling. The bags also damage equipment and increase the costs of dealing with your waste. Putting bags and normal waste in recycling collections is a waste of your time and effort – and means we can’t recycle. Green bins are collected seasonally and are used for garden waste such as grass clippings, tree and shrub clippings, weeds, dead flowers and leaves. Some households may also have a food waste recycling box, this is used for fruit and vegetable peelings, cooked food, raw meat & fish, bones, leftover food/plate scrapings. What happens to my recyclable waste once it’s been collected? Once the council bin lorries have collected your recyclable waste, it is brought to the Gilmoss Material Recovery Facility (MRF). Merseyside & Halton’s MRFs have the capacity to process over 200,000 tonnes per year, producing seven secondary raw material grades and diverting more than 63,000 tonnes away from disposal. At the MRF, a complex system of conveyors transport the recyclable material through the sorting process. The waste goes through both manual and mechanical checks to separate the waste in to steel, paper, cardboard, glass, aluminium and plastic. Any contaminated waste is removed by hand and sent to the Energy from Waste facility where it is used to create fuel for heat and electricity. After the sorting of the materials, balers are used to compress some of the recyclables into dense bales for transport and sent to facilities across the country where it is used to create secondary raw materials. What happens to my green waste once it’s been collected? Once your green waste has been collected it is delivered to White Moss’ composting site in Kirkby. Over the course of 12 weeks the green waste is transformed in to compost and blended with forestry bi-products such as wood-fines so that it can be recycled into quality compost that is sold in bulk to local and national landscapers and groundwork companies. What happens to the waste we can’t recycle? Despite our best efforts to reuse and recycle, there will always be some waste where these options are not possible. This waste can be used as potential fuel that can give value in the form of energy- this is known as Energy from Waste. Sending waste to landfill is no longer an option because when it rots it releases methane; this is a greenhouse gas that is a major contributor to climate change. Therefore, producing energy from waste is the best way to divert rubbish away from landfill. Energy from Waste is a tried and tested technology that converts waste into fuel that can be used to generate heat and electricity by burning it at a high temperature. Sefton’s waste is transported via rail from the Rail Transfer Loading Station in Kirkby to the Energy from Waste plan in Wilton. This facility accepts household bin rubbish, street cleansing waste and waste from MRFs. The Energy from Waste system has diverted more that 92% of rubbish bin waste from Merseyside and Halton away from landfill disposal. This has generated enough energy to power around 60,000 homes. 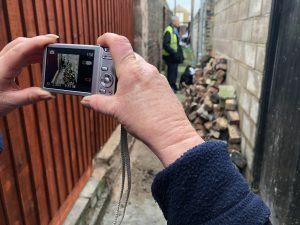 Sefton Council is once again reminding residents of their rubbish responsibilities following a crackdown on alleyway flytipping. A recent spot-check by the Local Authority’s Environmental Health Enforcement officers in the south of the borough uncovered a large amount of alleyway rubbish dumping and one resident was even caught in the act, resulting in her receiving a £400 fine. Each year Sefton’s cleansing teams have to remove thousands of tonnes of rubbish from alleyways across the borough, costing the Council £800,000 a year to clear up and dispose of. On average 20 tonnes of flytipped rubbish is left in rear alleyways and passageways each week, running up bills of £2,600 in disposal costs alone. 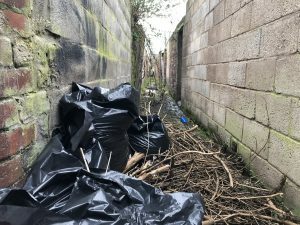 Cllr Paulette Lappin, Sefton Council’s Cabinet Member for Regulation and Compliance, said: “People dumping rubbish in alleyways costs the council hundreds of thousands of pounds a year to clean up and dispose of. “This is a huge bill to clean up after flytippers and our recent inspections show that there are still inconsiderate and irresponsible people who dump their rubbish illegally. “No matter if its a small bin bag or a huge pile of household waste, it’s still flytipping and you will be fined heavily for irresponsibly disposing of your rubbish. “Flytipping carries a £400 fixed penalty notice and failure to pay will land you in court. We won’t hesitate to issue a fine if we catch people doing it. “Each week our cleansing teams clear away tonnes of dumped waste from alleyways alone and this needs to stop. “Flytipping is not only unsightly and anti-social, but it can also be a serious risk to people’s health and can cause considerable damage to the environment. If any residents have any concerns regarding flytipping or wish to report an offence, they should contact us on 0345 140 0845 or report it via our website www.sefton.gov.uk. Residents will have the opportunity to recycle more from Sunday, April 1 as the region’s Household Waste Recycling Centres open for an extra three hours every day. The 14 Recycling Centres, which are provided by Merseyside Recycling and Waste Authority (MRWA) and operated by resource management company Veolia, will be switching to their summer opening hours, meaning they’ll be open from 8.00am until 8.00pm*, seven days a week. The Recycling Centres are situated throughout the region with all 14 available to use for all Merseyside householders. They accept all sorts of household materials for recycling, from batteries, cans and cardboard, through to garden clippings, glass bottles, wood, and white goods. They also accept lesser known items such as takeaway coffee cups, clothes, furniture and electrical items. A Van Permit scheme is in operation at all the sites meaning if you are planning to use a van or large trailer then you will need a Permit. Permits can be obtained free of charge by calling 0151 236 0305 or visiting www.merseysidewda.gov.uk. Our highways teams have been gritting since 2.30am this morning (Thursday March 8) and continue to do so. However the unexpected intensity of the snow, a number of schools have taken the decision to close. We’re encouraging residents to take extra care when out and about in the borough. All cleansing waste services have been suspended for today and will start up again tomorrow (Friday March 9) working a day late, collecting today’s waste , while working on Saturday to collect Friday’s Waste. For any more information, residents should consult our website, www.sefton.gov.uk, and social media channels, which are being regularly updated throughout the day. An ‘Advice Bus’ roadshow hits the street next week with all the answers to your recycling questions. Next week sees the launch of a new ‘recycling surgery’ roadshow across the Merseyside and Halton region. The Advice Bus, which is supported by Merseyside Recycling and Waste Authority (MRWA) and its contractor Veolia, will be touring a range of locations and with local council support will be able to solve your recycling problems and questions. The distinctive bus – which is being supplied by resource management company, Veolia – will also as be promoting recycling opportunities at the regions 16 Household Waste Recycling Centres. The free-to-use centres are located across neighbourhoods so that householders can recycle and dispose of items from their own homes – everything from grass cuttings to mattresses. Most centres can recycle more than 40 different items and materials. Carl Beer, MRWA Chief Executive said: “This is a trial project – with partners from all of our councils joining up to get out into the community, and speak with residents and communities.